Recording production by Shahzad Ismaily at Dampfzentrale Bern, February 2014. All music performed and recorded live, no overdubs or electronic effects. Mixed and mastered by Martin Ruch at Fidelity Suite, Berlin. Cover art: Luzia Rink. Cover design: Jonas Schoder. Photo: Matthias Günter. Julian Sartorius sein eigenes Instrumentarium. Er hat seinen höchst persönlichen Sound gefunden. tagebuch mit 365 Einträgen, spielte sich Julian Sartorius mitten in die Welt der Schlagzeug-Solisten. Durch die Auseinandersetzung mit elektronischer Musik sind neue Spieltechniken und Klangwelten entstanden. "Zatter", das ohne Einsatz elektronischee Effekte live eingespielt ist, führt in die phantastische Welt der Sounds, Klänge, Rhythmen – auch in ruhige, besinnliche und abstraktere Sphären. «Zatter» – obwohl es beinahe ein reines Schlagzeugalbum ist – kaum nach Schlagzeug klingt. Auch habe ich durch meine starke Auseinandersetzung mit elektronischer Musik neue Spieltechniken gefunden. Manche der Klänge auf «Zatter» erinnern an Synthesizer, andere an die zerhackte Spielweise mit Samples. So hat meine Arbeit mit Synthesizern und Samplern in meiner akustischen Spielweise eine Umsetzung gefunden. Dieses Album sollte die Musik meiner Solokonzerte widerspiegeln. Doch die blosse Reproduktion des Live-Materials hat mich nicht interessiert: Bereits nach den ersten Aufnahmeskizzen zeichnete sich ab, dass dieses Album eine eigenständige und neue Arbeit werden würde. Die wichtigste Grundidee habe ich aber beibehalten: Das Album sollte live eingespielt sein, ohne Einsatz von Overdubs, Schnitten oder elektronischen Effekten. rein akustisch entstanden, die Aufnahmen sind Live-Performances. Von der Schaffensweise her ist es mein «traditionellstes» Album. Hier unterscheidet sich diese Produktion von meinen Vorgänger-Alben «Beat Diary» und Merz' «No Compass Will Find Home (Julian Sartorius Drum & Vocal Renditions)». 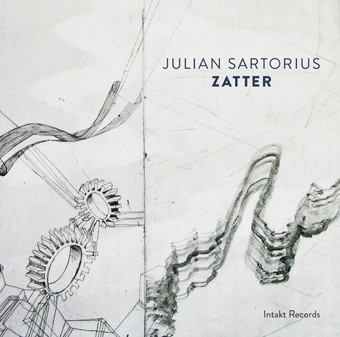 ancestors, Julius Sartorius has built his own percussion set to develop his his own sound. Sartorius made his name as drummer for vocalist Sophie Hunger. He played in Colin Vallon's piano trio and in Co Streiff & Russ Johnson's quartet and was involved in projects with Shahzad Ismaily. 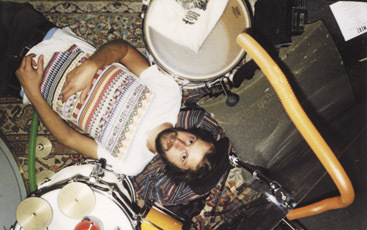 His debut solo album "Beat Diary" – a sound diary of 365 entries – placed him at the centre of the world of soloist drummers. Satorius has developed new techniques and sound worlds through his involvement in electronic music. This album, recorded 'live' with no overdubs, cuts or electronic effects, guides the listener into a fantastic world of sounds and rhythms, with no loss of tranquil moods and abstract atmospheres. 'Zatter' is an old Bern-German word which simply means 'the disorder arising when things are strewn all around'. Disorder is an important element in my work, because instruments and materials need to be mixed up to keep forming new combinations. So my studio at the Dampfzentrale Bern is a jumble of things, from rotating vibrators, Spanish goat bells, inner tubes, bullroarers, an old African marimba, rubber balls, a shruti box to various pieces of metal. It often threatens to degenerate into chaos, and nearly every week new instruments and objects are added. The entire inventory can be heard on this album, and this is one of the reasons why Zatter barely sounds like percussion, although it is a purely percussion album. My acoustic style has also been enriched with new techniques thanks my intensive engagement with electronic music. Some of the effects on Zatter are reminiscent of synthesized sounds, others of the cut-up sound of sampling, so the work I have done with synthesizers and samplers has clearly found its way into my live playing. The album is intended to represent the music of my solo concerts. But it didn't seem interesting simply to reproduce the material from my live appearances; right from the initial test recordings it was clear that this album would be a separate, new work. I did stick to the basic idea however: the album was to be recorded live, with no overdubs, edits or electronic effects. I wanted to work with the physicality and limits of the body, and the directness of performance. Each piece is entirely acoustic and the recordings are live performances. In terms of the way it was produced this is my most 'traditional' album and the production is very different from my previous two albums, Beat Diary and Merz's No Compass Will Find Home (Julian Sartorius – Drum & Vocal Renditions). On both these albums I worked with several recording tracks in order not to be trapped by the limits of the human body. Sometimes I resent having just two hands and two feet. In some musical situations it would be helpful to have more of both. But on Zatter I wanted to work with precisely these limitations. Zatter is also an album in which beats and rhythms are almost entirely obscured; the tracks are mostly calm, contemplative and abstract. The titles are all Bern-German words which have vanished from everyday use.